the pink clutch ...: So behind ... so, so behind! For now I am leaving you with this fabulous pink photo ... February is my favorite month of the year! And to celebrate it ... 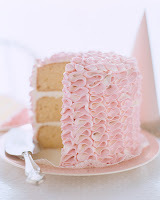 I shall post something pink on every post this month. I do LOVE pink! I am off to workout with June Cleaver ... be back later today! When you get a minute check out ashleys closet blog. Beyond funny story of girls weekend. Wishing I had some of that cake! Thanks for visiting my blog. I'm actually moving to the Atlanta area when my house sells...and at the rate the market is moving, it's not looking like anytime soon. I loved the pic in the previous blog of your son w/the missing tooth. As a teacher, kids just touch my heart!